This pair of modern boxers underwear has a Japanese theme. It has 2 poses for modern Sonic scattered all over. The background has red and yellow rays (possibly similar to 'rising sun' type rays) You can also see "Sonic" & "Sonic the Hedgehog" written in 2 different fonts in Japanese as well. The modern logo is an embroidered piece on the elastic black waist band. This is available at: New Look. Photo & owned by Shadouge. 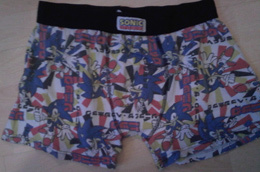 This is a classic style pair of boxers which uses "Sonic" written in a blocky font as the background, but also for a somewhat striped look. The stock art here is all the same thing the "Die Pose" for classic Sonic. It's a bit of an unusual choice, and the fact that it appears in a flame shape of yellow/orange is also odd. This pair has red accents and the classic logo for the waist band. This is available at: New Look. Photo & owned by Shadouge. 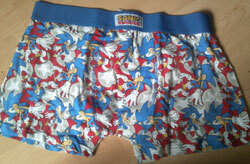 A pair of underwear that will stand out from the rest in a collection! This one uses comic-book style screen-tone dots for the background, & a big splashy Sonic graphic, with a scattering of stars. It's not too busy or loaded with designs. 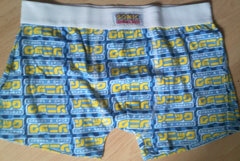 It has Sonic's name in Japanese written vertically down one side, while the modern logo is printed large across the waistband. This is available at: River Island in 2011. Photo & owned by Shadouge. waist are elastic as well for the black pair. The use of gray keeps it from looking too busy in both cases. They're actually likely just a variant of eachother, so you'd be going for the style/color you prefer. This is available at: New Look. Photo & owned by Shadouge. This pair is rather confusing, with its overlapping black & white line art. If you look carefully, you can pick out 2 poses for modern Sonic, and a scattering of solid black stars. 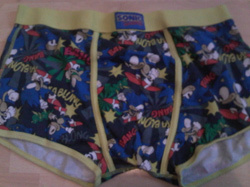 It may be busy, but it presents a very different look from the previous pairs of underwear. Found at New Look. Photo & owned by Shadouge. 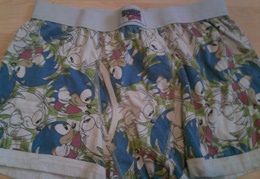 This is the only pair of boxers found at Primark in the UK. They look rather similar to the others, though you'll notice that only this pair has a blue tag on the waist band. This is classicly styled, with several of the old stock arts. It also has various small starbursts and sound effects written on it in comic style, such as "Bang, Boom, Blong". 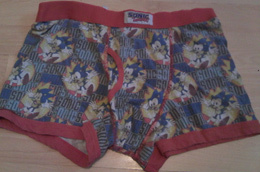 Sound effects and underwear are generally not the best combination...but the words do add interest for the background. Available at Primark in 2011 Photo & owned by Shadouge. Similar theme, different era-design-styles. The left pair has only spinning classic Sonic in line-art & color, while the right has modern Sonic & Tails, however, Tails is never colored/always line art. There are also star bumpers in blue. Both available at New Look in 2011 Photo & owned by Shadouge. A similar checker theme, but different places to find them. 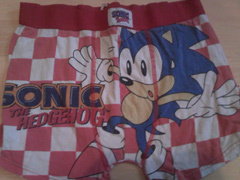 The right pair has small red checkers with various scattered classic Sonic faces, & the right is a bit bolder, with large red checkers & 'tilting' classic Sonic with a good big logo. Right pair found at Amazon UK, left at New Look Photo & owned by Shadouge. This design has been seen before, but on a poster. The different (non logo) font for Sonic (kind of hard to see among the pattern) also appeared elsewhere, along with the small black/gray checkering. Sonic himself is repeated several times in the same pose to help form the pattern. With colors so close in shade, it can be a bit of a confusing design. Found at New Look UK in 2011. Photo & owned by Shadouge. 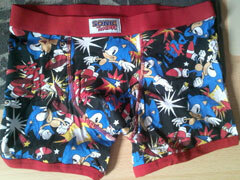 It's slightly hard to tell here, but this pair of boxers also uses the blocky font "Sonic" to form the stripes. You can see it written in yellow, green, red & blue. Scattered over this are various classic style Sonics, sometimes mirrored. The leg bands for this may also be elastic. Found at New Look in 2011 spring. Photo & owned by Shadouge. 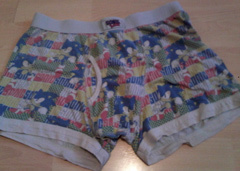 This pair of boxers has a slightly different cut than the previous pairs, and is from Matalan (store) instead. 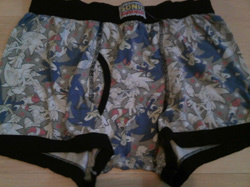 It has black & white all-over checker pattern, with large classic style Sonic art at an odd-angle for interest. Curiously, there's a starburst and the sound effect "Bang!" written in pink behind his head. 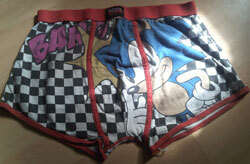 It's likely supposed to add a cartoony feel to the pair, but is underwear really the place for sound effects? Still, the over-all look of the design is rather nice. Photo & owned by Shadouge. 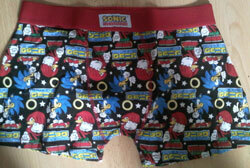 This is a different sort of Sonic boxers...being as that it has no actual picture of Sonic anywhere on it. Instead, there are only blue blocks/bricks pattern with Sonic's name in Japanese (twice) on each one in. Some rows are right-side up, others are upside-down. 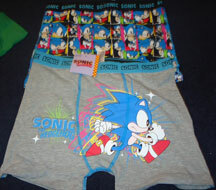 Each says "Sonic Sonic the Hedgehog". The white waist band has the normal modern logo. Found at New Look in 2011 Photo & owned by Shadouge. 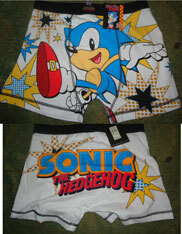 Here's a great pair for Knuckles fans too! 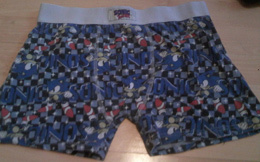 This boxers has modern Sonic & Knuckles alternating being right-side-up, along with Sonic's name in Japanese in a smaller blue panel. There are also rings and stars on the black background to help make the pattern. It's nice to see Knuckles added in to more designs! Found at New Look in 2011 Photo & owned by Shadouge. 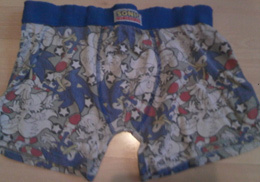 These boxers almost match a pair of pajama bottoms in pattern. They have various poses for classic style Sonic scattered around on the black background. There are also starbursts and sound effects written in various fonts. You can see "Ka-blam" and "Splat" written in various places. Found at New Look in 2011. Photo & owned by Shadouge. 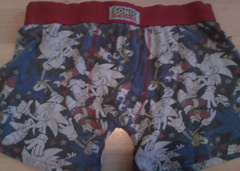 This pair of boxers combines something new (modern Sonic) with something more a staple of classic items (the round star bumper) The red background makes Sonic's shoes a little confusing here, but you can certainly pick him out among the gray & white star bumper shapes. He's scattered all around at a size that almost makes these a bit busy, though. Found at New Look in 2011. Photo & owned by Shadouge. 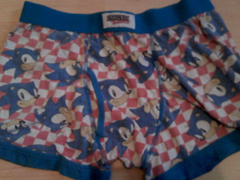 This pair of boxers comes in kids sizes only (unlike the previous pairs) It has classic running Sonic with "Vrroom" sound effect written across the blue checker background. Notice the tag though, it has the 20th Anniversary logo on it. These are Primark, & seen here directly in-store. Photo by Shadouge. 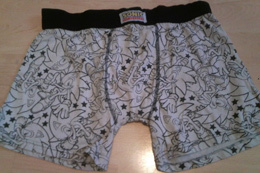 This is a boxer/breif style underwear which can be found at NEXT stores in the UK area. It's done in Japanese style, with classic stock art, and Sonic's name written in Japanese beside it. The background is a loud mix of red and green, with the hot pink text and blue Sonic mixed in. 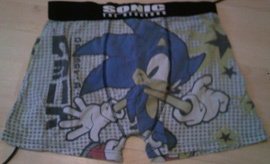 The waistband (for whatever reason) says "Super Sonic" though actual Super Sonic is no where to be found. 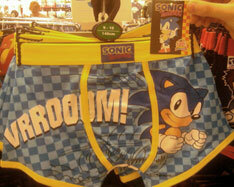 Loud though it may be, it is fantastic to see modern underwear in reasonable sizes with Sonic on it! A great item to collect.